On April 17-18, 2007, 57% of the students who voted passed the referendum to build a recreation center. Develop premier campus recreation facilities, which provide the CSUN community with opportunities for exercise and other recreation/leisure time activities that promote lifelong wellness and support student recruitment and retention. Create facilities that incorporate eco-friendly components that bridge architecturally and philosophically with the University Student Union and are consistent with the overall university mission and campus physical master plan. Create recreational programs and facilities that foster CSUN spirit, and provide an environment that is welcoming, comfortable and fun. Ensure student involvement in the decision-making and governance processes. 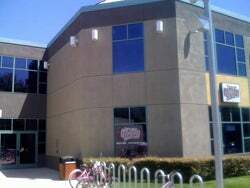 The Fitness Centre opened its door to CSUN students, faculty/staff, and alumni in the Spring of 1995. Being a partnership between Associated Students and the University Student Union, the Fitness Centre served the entire campus community. The purpose of the Fitness Centre's programs and services was to offer CSUN students, faculty/staff, and alumni members the opportunity to engage in a healthy lifestyle. Through the facility, equipment, and human resources, the Fitness Centre provided a motivational environment in which our patrons were encouraged to maximize their results. Additionally, through other collaborative efforts with other groups and departments on-campus, it was our greatest desire to make fitness and wellness an integral part of campus life. On January 16, 2012, the Fitness Centre closed to make way for the Student Recreation Center...Where Matadors Play.